Briles’ subsequent development and professional baseball success came from his ability to learn and overcome the many challenges associated with pitching. In particular, he benefited tremendously from watching and learning from his teammate and baseball idol, Bob Gibson. Nelson Kelley Briles was born on August 5, 1943, in the very small town of Dorris, California. He was the third son of Ray and Nyles Briles. Both his parents worked in the lumber industry. His father was a general mechanic. His mother caught and sorted boards as they were sawed. By the time he reached Chico High School, Briles was an all-around athlete. In football, he was a T-Formation quarterback and the team punter. He played varsity basketball and pitched for the baseball team. When he didn’t pitch, he played third base. In high school, Nellie was a speech major. He starred in a school production of “Damn Yankees,” where he initially met his future wife, Ginger Moore.7 He married Ginger in 1965. His performance quickly brought a bonus offer from the Giants. San Francisco, however, had recently given another Santa Clara pitcher, Bob Garibaldi, a $100,000 bonus. By contrast, the Giants made Nellie a relatively modest offer of a $10,000 signing bonus and a minor league contract. Several other teams, including the Cardinals also made offers to Briles. Cardinal scout Bill Sayers signed Nellie to a contract with an estimated bonus of $40,000-$50,000. Nellie’s numbers for his first season of organized baseball were impressive. He completed the season with an 11-6 record and a 2.79 ERA. He appeared in 28 games, starting 25 of them. He walked 61 while striking out 132. Briles attended Chico State University in both the fall of 1964 and 1965 primarily to be with Ginger. 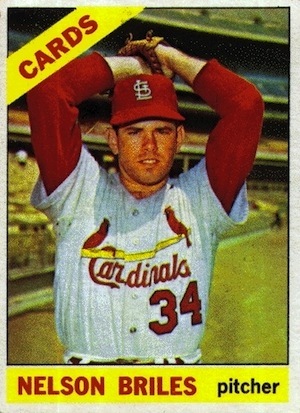 Because he received a signing bonus in 1964, major league baseball required that the Cardinals put Briles on their 1965 major league roster or risk losing him in the first year draft. St. Louis protected Briles. The powerful and highly competitive Bob Gibson led the 1966 Cardinals pitching staff. Briles used Gibson as his pitching model. Late in the 1966 season, Nelson made some significant changes to his pitching approach drawing on his observations of and discussions with Gibson. Briles started Game 3, pitching for an angry team. In Game 2, Boston’s Jim Lonborg threw his first pitch close to left fielder Lou Brock’s head. As veteran sportswriter Red Smith later described the pitch: “it bore straight and true for the right ear of Brock.” Lonborg went on to a convincing 5-0 victory. Red Sox Triple Crown outfielder Carl Yastrzemski hit two home runs. The 1968 World Series pitted the Cardinals against the Detroit Tigers. Schoendienst scheduled Briles to start Game 2. Gibson opened the Series with another dominating victory in Game 1. The Tigers rebounded to bludgeon Briles and the Cards 8-1 in Game 2. Nelson worked 5 1/3 innings and allowed four runs. Briles and Lolich opposed each other again in Game 5 played in Detroit. St. Louis needed only one more victory to win the World Series. The Cardinals jumped on Lolich immediately plating three runs in the first. The Tigers scored two runs in the fourth. The fifth inning brought a controversial play for St. Louis as Lou Brock tried to score from second base but was out on a close play. All major league pitchers began their 1969 season adjusting to a significant pitching rule change. After a season that saw very little hitting, the pitcher’s mound was lowered from 15 inches to 10 inches. Briles immediately recognized that the new rule directly affected him, particularly his overhand curve ball. Without the leverage of the mound, his fastball would also slow down. By the end of August, Nelson had appeared in 32 games, starting nine times and relieving in 23. The nature of Nelson’s pitching contribution changed dramatically in September when he started five games and did not make a relief appearance. The Pirates finished 12-2 in games that Nelson pitched as a starting pitcher and 19-18 in all of his 1971 appearances. Briles went out and pitched his best game of his season. He threw a complete game 5-0 shutout against the Orioles, allowing only two hits and walking two. Nelson also got a key single, driving in one of the Pirates’ four runs. After the game, Briles publicly acknowledged the unwavering support of the Pirates’ organization and his family.46 The Pirates went on to win the 1971 World Series, erasing a 3-1 deficit. Briles again found himself in a battle for a 1972 starting pitcher berth.49 Nelson appeared in the fourth game of the season as a relief pitcher. However, it would be his only relief appearance of the season. His next 27 appearances would all be as a starting pitcher. Nelson began the 1976 season as a Ranger starting pitcher. He appeared in 32 games, pitched 210 innings, and posted an 11-9 record with a 3.26 ERA. His 31 starting appearances included seven complete game victories. His innings pitched total nearly doubled his 1975 mark.59 During the winter, Nelson was honored at the annual winter baseball banquet in Fort Worth as the Ranger “Pitcher of the Year” for 1976.60 The team, however, finished in fourth place with a 76-86 record. 37 John McMurray, “Nelson Briles: a key performer for three pennant-winning clubs: before his untimely death last February, former pitcher reflected on his 14-year major league career.” FindArticles/Sports/Baseball Digest, May 2005, http://findarticles.com/p/articiles/mi_mOFFCIis_3_64/ai_nll3684036/?tag=content:col1, accessed 2/28/2012. 65 Rick Hummel, “Former Cardinal Nelson Briles dies,” St. Louis Post-Dispatch, February 12, 2005. 67 Nate Guidry “Obituary: Nelson Kelly ‘Nellie’ Briles/Former Pirates pitcher and front-office official,” Pittsburgh Post-Gazette, February 14, 2005, HOF Briles Clippings File, accessed 12/30/2011.